I find this interesting because it is an example of a widespread phenomenon among humans: we tend to repeat what we have heard or read without checking how accurate it might be. We could say that many world religions have started and expanded in this manner. The words above come from a poem written by Marianne Williamson in her book A Return to Love, but it is quite often cited, quite incorrectly, as having been part of Nelson Mandela’s inaugural speech – this is how it was presented to me during a Reiki training workshop in the 1990s. Regarding the three quotes I have mentioned many people might say that it doesn’t really matter and that it is the essence of the message that is important. But if we replace the words “Einstein once said” or “Goethe once said” or “Nelson Mandela once said” with “God said”, “Jesus said” or “[insert name of god or prophet here] said” would we not find that the details matter a great deal more? Just because it is written somewhere that somebody once said something interesting doesn’t mean it is true and doesn’t make any difference to what is happening right now. Many of the sayings attributed to Jesus appear to contain a great deal of wisdom but would those words mean any less if Jesus had not said them? Many people like to back up their theories by saying that it is written in some ancient text and therefore it must be true. Deciphering the Bible and trying to decode its hidden messages is a pastime that keeps many people occupied for many a long hour – but does it really matter and will it change your life in any way? Whatever Einstein actually said, the quotes that are attributed to him contain wisdom. If we want to solve our problems we do indeed need to raise our consciousness. Keeping an open mind, aligning with our Inner Essence and allowing our light to shine are all ways in which we can do just that. When it comes to personal development topics, clichés are commonplace and it is all too easy to talk in catchphrases without ever considering what they mean. It can be so easy to retell the same stories we were told, without questioning their validity. People talk about “universal energy” and “universal laws” but what do these phrases actually mean? Do they mean that the energy and laws of which they speak exist throughout the universe, and if so, how can anyone know that? One story which often gets retold is the idea that the crucifixion of Jesus on the cross was somehow meant to be interpreted symbolically as the “crossing out” or sacrifice of the ego for the higher self – the idea being that the horizontal line represents the “crossing out” of the ego or “I” which is represented by the vertical line. But, to the best of my knowledge, “I” is only represented by a vertical line in the English language – “I” is not a vertical line in Hebrew, Aramaic or most other languages. So are we to conclude that Jesus allowed himself to be crucified just to make a symbolic point to anyone who understands English? I must admit I actually like the symbolic interpretation of sacrificing the ego for the higher Self, but we must be mindful not to see these interpretations as anything more than that. We must be mindful not to take such interpretations to be reality itself. As I mentioned in the introduction to this book, Absolute Truth is beyond all expression. Whatever we say can only ever be one expression of that truth. What matters is not what someone else has to say, but what is true for you in this moment. What resonates with you? What rings true for you? Your truth is equally valid as mine. One person may say that all fashion is a waste of time and nothing more than glamour or illusion, but another person may believe that she is healing an emotional wound by becoming a successful fashion designer. Truth is relative to the perceiver. As I mention at the beginning of this book it can often seem as though the words available do not seem to do justice to the intended meaning, but is it the language which is limited or our willingness to find the right words? I often fall into the habit of talking about “things” when I don’t mean “things” at all. I also tend to say “things” like “what matters is…” instead of finding alternative words such as “what seems important is…” The reason I believe it is important to at least attempt to express ourselves in our own words is so we can look more deeply into what it is we believe. It is through the very act of sharing what we think we know with others that we find out how much we really do know and how much there is still to learn. If we hide behind the spiritual clichés of “it’s universal energy, everything is in divine order, we are always perfect all of the time, life is a mirror, it’s all about surrender, everything comes from the Oneness” etc, without ever considering what it is we mean when we say these words, how will we ever find out who we really are? There is so much more I could have written in this book and there are so many different ways I could have attempted to convey the same meaning. For a writer, the process of writing can form part of his own development and writing this book has been an integral part of my own journey over the past few years. The process of sharing with others what we think we know can become a never-ending loop of expression, feedback, refinement, further expression, more feedback and so on. Perfectionism can be a double-edged sword: on the one hand we strive for attention to detail, doing things properly and doing the best we can; but on the other hand we need to be mindful of the kind of perfectionism which says that what we have done is not good enough. Many of you with a keen eye will no doubt have spotted several repeating themes in this book: the need for open-minded enquiry; the feeling that we don’t have enough “data” to be able to draw conclusions; and the importance of expressing our own truth. Maybe these are signs that I am holding back, afraid to jump into the abyss of faith and accept as true that which I cannot see or that which is not verified by other people’s experience. Having observed these repeating themes myself, I could have edited the book accordingly and smoothed out the wrinkles. But to do so would, I feel, be dishonest. This book is not about showing you that I am perfect – far from it – it is more about encouraging an honest expression of who we are, or at the very least, who we think we are. If we airbrush our photos and hold back on our truth, what are we saying about ourselves? In some respects a book can only be perfect if we believe in absolutes and finites – in other respects the perfect book is one which honestly expresses what the author has to say at that time, in the full knowledge that learning is an ongoing journey. I am not the sort of person who believes in the kind of enlightenment which has an endpoint and a definite path to reach it. For me, enlightenment is a constant unfolding, an ongoing dance from one moment to the next. Many years ago I asked a spiritual teacher if “knowing” was based on data. My question related to Google – if the Google search engine was programmed with every bit of information in the universe, would it know what I was thinking and what I wanted? The answer I was given was “No” because this kind of data could be considered to be linear data whereas the data of knowing would be more akin to holographic data. The answer did not fully satisfy my yearning, for reasons that have only just become clear. Having written this book I can see that the existence in my mind of the question about data (and the subsequent feelings that we “don’t have enough data”) arose from a desire to experience knowing. Deep within me an immense yearning existed to know with absolute certainty that something was true. But, stuck in my mind as I was, I was unable to feel that yearning and so I experienced it at the level of thought, as a question about data. What I wanted to know was “If I had more data would I have more knowing?” The reason that the spiritual teacher’s answer did not satisfy the yearning was because I needed to “get out of my head and into my heart”. It has only been through the process of writing this book, of speaking my truth, in my own words, that I have been able to arrive at the place of knowing I craved. Whether the time we spend on this earth takes us deeper into wisdom or simply serves to create different ways of looking at life depends on how we choose to approach it. I see ahead of us, not only new ways of looking at life, but also deeper wisdom. I see a kind of spirituality without hierarchies, where the collective wisdom of our species becomes opened up for anyone to download. Whether we talk about uploading wisdom to the cloud, adding to the collective consciousness or creating morphic fields of knowledge doesn’t matter – the result is the same: a world in which all the ideas, enthusiasm and inspiration we need will come from within, not so we can become isolated and believe that we don’t need other people, but in such a way that the ideas, enthusiasm and inspiration come to show us where to go, what to say and with whom to connect at any one time. It is by the very act of looking within that we will form stronger and more intimate bonds with people in the outer world. Cohesive bonds lead to the kind of strength that will be the hallmark of the new era of consciousness which I see ahead for our species. Instead of looking outside of ourselves for other people to lead the way, leadership will come from the very essence which binds us together, the light within each of us which is the Source of everything that is beautiful, joyous and wonderful. A flower knows exactly how to blossom because all of the information it requires is encoded within the seed from which it grew. You also have a seed within you which contains the very wisdom and knowledge required to help you to grow and bloom. The Source of your own spiritual unfolding is within you, in the light of who you really are. 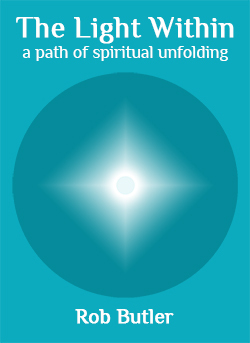 I hope you have enjoyed this book and I sincerely hope that, on your own spiritual journey you will find the courage to live your own truth and allow the light within you to shine.